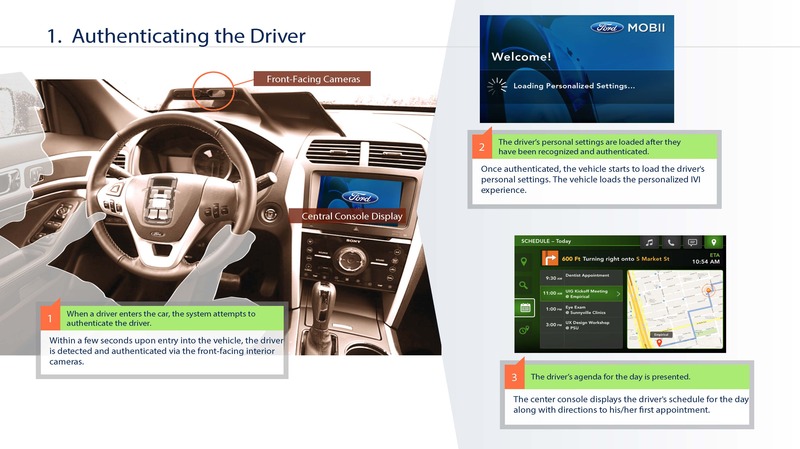 Ford and Intel have partnered together on Project Mobii, an automotive initiative that is experimenting with interior-facing cameras to make driving and mobile device usage in the car safer. It may also be a precursor to how wearable devices and vehicles start communicating together. Ford announced Mobii at a press event at its headquarters in Dearborn, Michigan on June 25 as the automaker’s attempt to get into the Internet of Things. The interior camera’s primary purpose is to know who is driving through face recognition, and then adjust all the infotainment features and settings specific to him or her, like radio presets, apps, contacts, navigation maps and more. The vehicle would have its own data connection to maintain contact with the owner’s smartphone or tablet on demand. This kind of tailored and personalized experience would attempt to solve a few inherent issues related to using mobile devices in the car. First, it could disable a driver from accessing certain features and functions, while allowing passengers to touch inputs on the infotainment screen unhindered. Second, it would do that without compromising any of the driver’s personal data. And third, it would allow the car’s owner to decide who can drive the car, and set a number of restrictions — a virtual dream for any helicopter parent looking for added peace of mind when their teens take the wheel on their own. That course of action may turn out to be controversial in its own right, but at the root of this is Big Data. The vehicle’s diagnostics and analytics can be funneled over to your smartphone and off to Ford’s servers, too. That kind of data web would ostensibly mean wearable devices, like fitness wristbands and trackers, among others, could “talk” to the vehicle as well, monitoring one’s physical state in the driver’s seat. Intel’s wearables team is currently being led by a former Apple executive, who has reportedly targeted vehicle manufacturers as a key area of focus. In the case of Mobii, Intel wouldn’t have the final say on what actually goes into the system or not, as that would be Ford’s call to make. Ford, too, is looking into how wearables might eventually work, with a particular view on where Big Data might come into play. The possibilities seem almost endless, though questions over trust and value will likely define what sort of path the company will take. While impaired driving has long been the focus of safe driving advocacy campaigns, driver distraction through mobile device usage has risen to become the top concern. Driver fatigue has also been a recurring and underlying problem that is difficult to identify, much less mitigate. With Mobii’s combination of cameras and an improved voice-recognition system within Ford’s SYNC system, hands-free operation would extend much further than just making and taking phone calls. In addition, locking out certain features through actual physical input could help lower distraction and maintain better focus. It’s also hoped that wearables might continue to evolve and be better positioned to monitor and recognize a driver’s condition to mitigate any potential issues due to fatigue or drowsiness. At least one attempt has been made to deal with the latter in the form of the Anti Sleep Pilot, a Danish-made module that can help a driver know when it might be time to pull over for a coffee or a brief rest. There’s also an iPhone app that does the same, though it doesn’t appear to be available on the Canadian App Store. Still, Mobii is entirely conceptual at this point, with no clear road map on when it will be deployed in future Ford vehicles. The final version may turn out to be different than what has been showcased in the video. One thing that is clear is that Mobii will work regardless of what kind of connectivity the car will ultimately have. 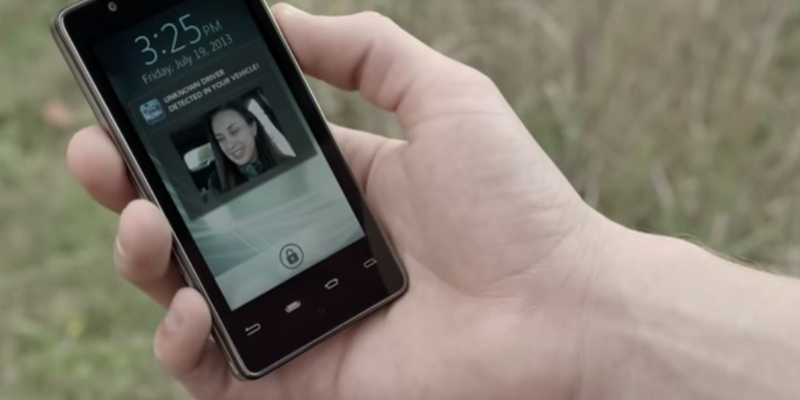 It’s being designed to be agnostic to both an in-car SIM or data from a mobile device. “The point-of-view of Project Mobii is that the vehicle is going to be connected anyway, and we’ll go with whichever mechanism turns out to be the most effective,” says Greenberg. Mobii’s unveiling came sandwiched between Apple’s CarPlay and Google’s Android Auto announcements, which could considerably shake up the automotive space by streamlining how iOS and Android translate to the car, respectively. While not an operating system or even a full-on platform, Mobii would have to be developed and updated just as fast.